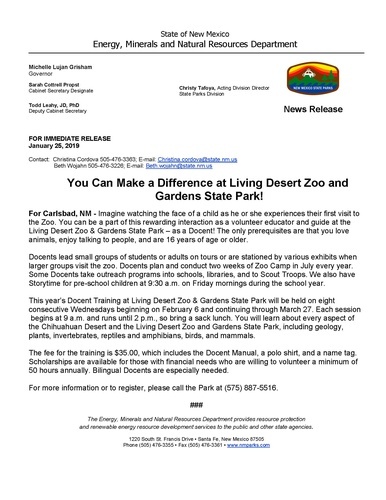 For Carlsbad, NM - Learn about the Chihuahuan Desert and become a volunteer teacher and guide by attending Docent Training at the Living Desert Zoo & Gardens State Park. This year’s training is scheduled for eight Wednesdays beginning February 6, 2019 and continuing through March 27. Training begins at 9 a.m. and goes until 2 p.m. with a half hour for lunch (bring your own lunch). The fee for the training is $35.00, which includes the docent manual, polo shirt, and name tag. Scholarships are available for those with financial needs who are willing to volunteer a minimum of 50 hours annually. Bilingual Docents are especially needed. For more information or to register, call (575) 887-5516.